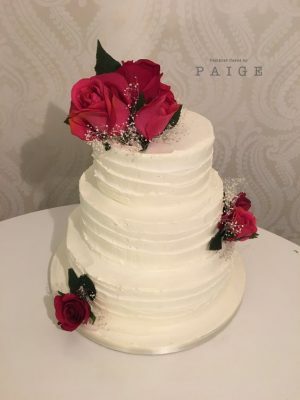 Simple buttercream wedding cake with a bold pop of colour from these beautiful fuchsia roses. 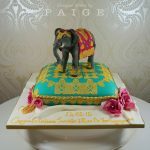 Here in the heart of Glasgow’s West End we specialise in bespoke cakes for all occasions. 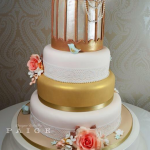 Whatever your big day is like, we can create the perfect cake to help celebrate. 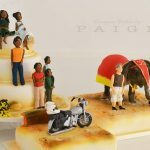 This cake, made up of 6″, 8″ and 10″ tiers will serve up to 100 portions. *Portions are based on 1″ by 2″ slices. 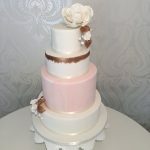 If you require extra portions, ask us about adding an extra tier to this design or a cutting cake on the side for cost price!